The community currently includes an unhealthy mix of residential, commercial and industrial uses mingling together on a block-by-block basis. The first order of business is separating those uses. The San Diego City Council is set to vote on a new community plan, a blueprint for long-term growth, for Barrio Logan this week. It’ll be the first community plan the city renews since the 2008 update of the general plan, the citywide growth vision that 50-plus communities are expected to follow. In the coming years, a number of new plans are due for approval. For most, density, new parks and public transit will be among the major issues. But Barrio Logan has a much bigger flashpoint. Its community currently includes an unhealthy mix of residential, commercial and industrial uses mingling together on a block-by-block basis. The first order of business is separating those uses. The plan, a 250-page document with an 800-page environmental report, also sets up Barrio Logan as a walkable, mixed-use environment, defines public investment priorities and aims to attract development. 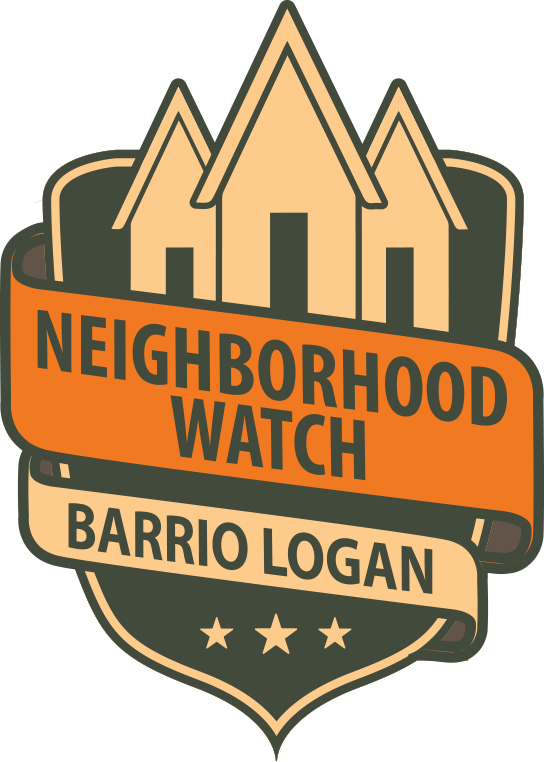 Here’s your primer on Barrio Logan’s new land use constitution. 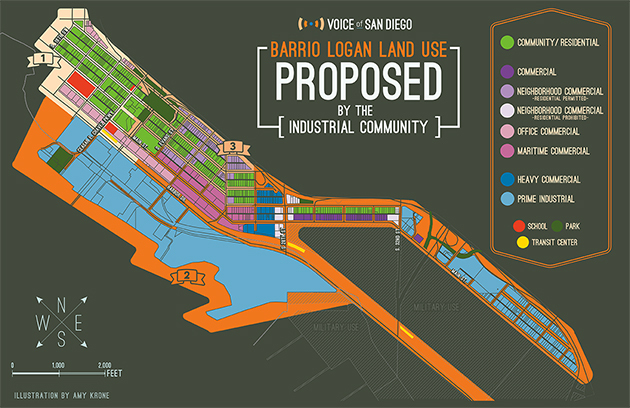 The new plan for Barrio Logan calls for a “community village” in the portion of the community closest to downtown. Most new housing would go here, including affordable housing units and a pedestrian-friendly commercial area. The area includes Chicano Park, the newish Mercado del Barrio residential and commercial project, affordable housing projects, the new San Diego Public Market, Monarch School and Perkins Elementary. It’s bound by 16th Street to the west, Logan Avenue to the north, Evans Avenue to the east and Main Street to the south. Cesar E. Chavez Parkway runs through the area, and would be promoted as its main thoroughfare. The plan looks to attract developers by changing zoning to boost density, and loosening parking requirements. The plan allows for more density for buildings that include affordable housing. It also calls for the creation of what’s called a “parking in-lieu fee,” where developers could simply pay a fee to duck requirements they provide parking. It’s aimed at encouraging development and reducing reliance on parking in a dense, transit-accessible area. “I think the plan does a great job of incentivizing as much as it can, without saying, ‘If you want to build here, we’ll give you some money to do it,'” Estrada said. Joe LaCava, chairman of a citywide group that advises local planning groups, said the plan’s creation of the community village area is one of its strongest elements. “It recognizes that this is an appropriate, logical extension of downtown, that makes use of transit and where density is acceptable,” he said. Barrio Logan has three Blue Line trolley stops and more than a dozen bus stops. The entire community is within a quarter mile of a transit stop; 88 percent is within an eighth of a mile. The area is well-served by transit, and the plan encourages SANDAG and MTS to provide nicer amenities and safety features at existing stops to entice riders. Decreasing the neighborhood’s parking requirements should also goose transit demand. The plan also seeks to incentivize transit use in unconventional ways, such as “encouraging” employers and new developments to provide transit passes at reduced rates to workers and residents, and for new developments to provide car-sharing spaces. There aren’t any specifics, however, on how the plan will encourage those moves. That means a developer, city employee or resident could interpret “encouraging” in different ways, potentially causing problems down the line. “That’s a specific example of an old approach to planning, of having noble ideas embedded in plans, and there really is no implementation method, or they can be interpreted in different ways to different people,” LaCava said. That’s one of the disadvantages of a plan that’s been years in the making – approaches to planning shift over time. The community’s conflict between the shipyard and the residential area also complicates attempts to spur transit use. The Harborside Trolley Station, at 28th Street and Harbor Drive, is well-placed as a transit destination for the shipyard right at its front door. But, according to a formal comment on the plan’s environmental document by local planner Howard Blackson, the complex zoning arrangement surrounding the station will create unpredictability for future projects. It “represents an opportunity lost to clearly coordinate a mixed-use, walkable neighborhood at the Harborside Trolley Station,” Blackson wrote. Creating a buffer between the most harmful industrial activities and residents has always been the plan’s biggest challenge. It’s also the final sticking point. The new plan would create the buffer between Harbor Drive, Newton Avenue, Evans Street and 28th Street. The shipyard is south of Harbor Drive; the community would be largely residential north of Newton Avenue. In the blocks just north of Harbor Drive, the plan calls for commercial zoning for retail and office uses – no drive-thrus or residences allowed. North of that, in the last stretch of the transition area, the blocks would be zoned for mixed-use development: more retail and office uses, but developers could include residences in their buildings, at medium density. The maritime industry wants to remove the option to put new residences there. Councilman David Alvarez, who represents the area and is running for mayor, and the city’s planning director Bill Fulton have said they’re willing to accept that request. So in the end the whole area will likely be reserved for commercial space. But the plan also says certain maritime-related industrial businesses – industry vendors that don’t manufacture on site – can be opened in the area, if they get what’s known as a conditional-use permit. Community members can oppose such permits. It’s safe to say local residents would strongly oppose most, if not all, permit applications. Alvarez and the Environmental Health Coalition don’t support that change. There’s also a stretch along Harbor Drive, between the community and the shipyard, zoned for office space, and other limited commercial uses. Residences are prohibited there, and the hope is the office space can be used for the shipyard’s administrative needs. The city also put together a second plan the Council can consider, which would put “maritime-oriented commercial” in the buffer, rather than the type of commercial allowed there now. While the industry has begun advocating for the city’s preferred plan with a few tweaks, rather than the official alternative, in function the tweaks they’re requesting are a lot like the official alternative. The maritime industry’s concerns take two forms. One is over specifics – whether new suppliers can open in the blocks just north of Harbor Drive. They also cite the reduction in overall space available for industrial use. The other is more existential: They perceive a looming threat to the industry itself. Industry backers want to stop the encroachment of non-industrial uses. And that area just north of Harbor Drive is the boundary they’ve drawn. They say the new zoning creates a sense of imminent danger to their whole industry. Today, suppliers on Harbor Drive. Tomorrow, the whole shipyard. “We think there are people involved in this process who would like nothing more than to see the shipyards go away,” said Chris Wahl, a spokesman for the industry. The passage of any new plan won’t act as a light switch that instantly untangles the community’s hodgepodge of conflicting uses. Business owners and residents whose properties are in re-zoned areas will still have pre-conforming use rights: They can keep using their property the same way, since it was established under the previous zoning. Those properties can be bought and sold, too. They can’t be expanded, though, and if they sit vacant for two consecutive years, the new zoning takes over. By the city’s count, 20 to 25 businesses in the community would have previously conforming use rights. The new plan also expands the heavy industrial area at the southern tip of Barrio Logan, south of Wabash Boulevard, where residences are currently allowed. There are about 30 homes in that area that would become previously conforming as well. One of the most important things a new community plan does is compile a list of public facilities the neighborhood expects it will need. This section also sets fees developers must pay to help finance those projects. Together, it’s called the Public Facilities Financing Plan, though it doesn’t cover the full cost of the project list it creates. Paying for all the items on the list would require additional funding streams, such as the city’s general fund. The plan also says the community should pursue grants to help close the gap. The list put together by city staff includes funding for 25 transportation projects, seven park and recreation projects, fire station number seven and the Logan Heights Library. The development fee per residential unit is being increased from $10,737 to $13,178. The increase is due mostly to the increased emphasis on park projects. The development fees in Barrio Logan would become some of the most expensive in the city, though that’s partially a function of the community’s basic characteristics. Since it’s small, it doesn’t have much opportunity to collect fees in larger quantities, and since its older, it has more needs. The new $13,178 per-unit fee would be the second highest in the city for the 2014 fiscal year, behind only Tierrasanta’s $15,290. The city’s plan looks to increase the community’s housing stock to accommodate expected population growth. And it’s trying to use affordable housing to make sure residents don’t get priced out of the area. Part of that means upping density in the community village area. Another part includes allowing granny flats, a second dwelling unit on a residential lot often used for aging family, in the low-density areas. And it’s also looking to encourage “live-work” units for working artists. Overall, in addition to the added density, the plan is dedicating 10 additional acres to housing. Here’s a breakdown of the community’s acreage today, and what it would be if the new plan was fully built out. Bouncing back and forth between the two charts also shows just how much industrial space will remain in the area, despite the industry’s concerns of encroachment. And commercial land, not residential, is the biggest gainer. The plan has a series of affordable housing goals, such as encouraging market-rate units that aren’t subsidized, but that are affordable for households making up to 150 percent of the median income. And it also uses tools like density bonuses – letting developers build bigger projects if they agree to include subsidized, affordable units. Another way planners hope to spur development in Barrio Logan is by removing the need for a coastal development permit – which must be approved by the Coastal Commission – in certain areas, including the community village. All of the Barrio Logan community is in the coastal overlay zone. Therefore, virtually all projects need to go to the Coastal Commission for approval. New projects that conform to everything else written in the plan would be able to skip the Coastal Commission process, assuming the commission approves the plan. The exclusion area covers the community village, and the rest of the community along Logan Avenue. Unlike other community plans, Barrio Logan’s also included an “arts and culture” element, where it described ways to embrace the community’s historic Latino heritage. It calls for things like encouraging diverse art installations, requesting that new projects include public art and using temporarily vacant storefronts for temporary art installations. Since the whole Barrio Logan community is in the state’s coastal overlay zone, the plan itself needs to be approved by the Coastal Commission. The plan’s not official until that happens – and it could take until 2015.